In the lobby entrance of Morningside Elementary School in the City of San Fernando, CSUN VITA Clinic accounting student volunteers stand with Bookstein Chair in Taxation and Director of VITA program Rafi Efrat, Dean of David Nazarian College of Business and Economics Kenneth Lord, Congressman Tony Cardenas, Senator Bob Hertzberg (D-Van Nuys), Morningside Principal Oliver Ramirez, Morningside parent and taxpayer Maribel Gonzalez, and Citigroup Global Director Bob Annibale before the press conference began. Photo by David J. Hawkins. Senator Bob Hertzberg addresses the crowd emphasizing that the number of taxpayers served by VITA increased tenfold from 369 to more than 3,600. This year, he hopes to increase the number of Earned Income Tax Credit (EITC) to $13 million. Photo by David J. Hawkins. 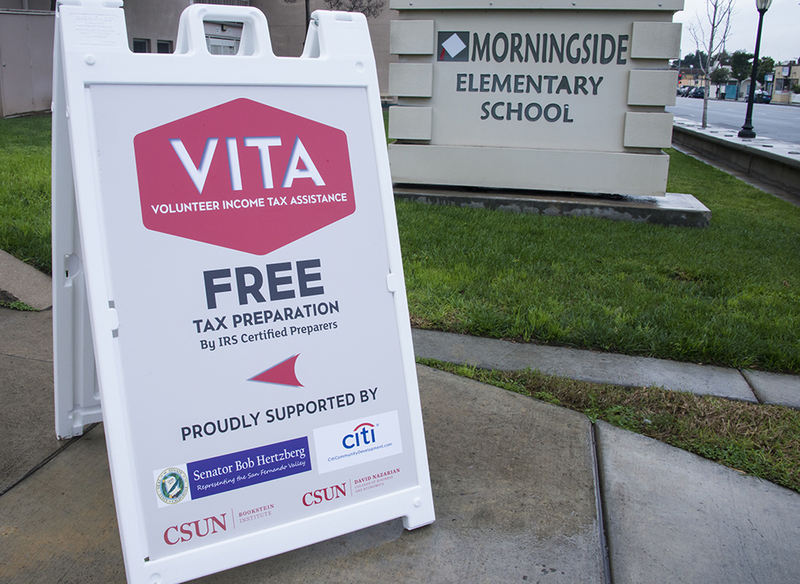 Sign posted in front of the steps of Morningside Elementary School, one of three new clinic locations opened in the City of San Fernando, announcing the free tax preparation services provided by CSUN accounting students available inside the school for community members to use. Walk-ins and appointments are available at each site. Photo by David J. Hawkins. 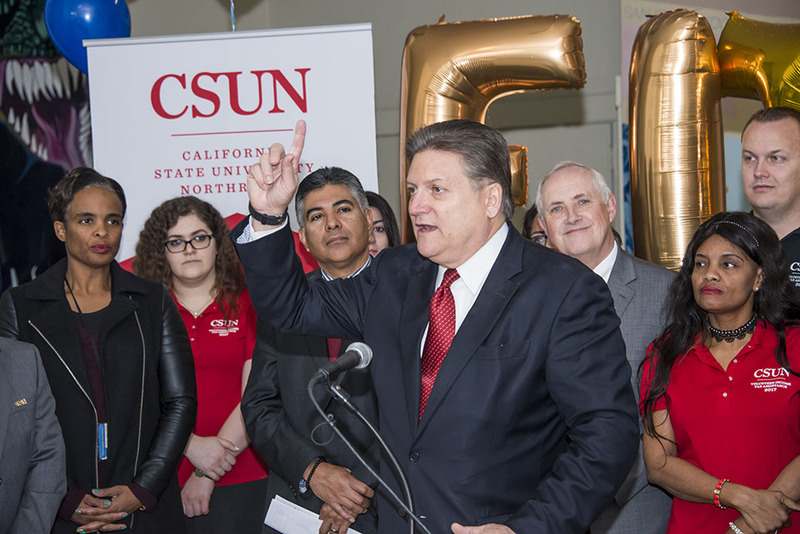 Joined by community members on Feb. 21, Sen. Bob Hertzberg (D-Van Nuys) announced a new partnership with California State University, Northridge’s income tax preparation assistance program during a press conference at Morningside Elementary School, one of three new clinic locations in the City of San Fernando. 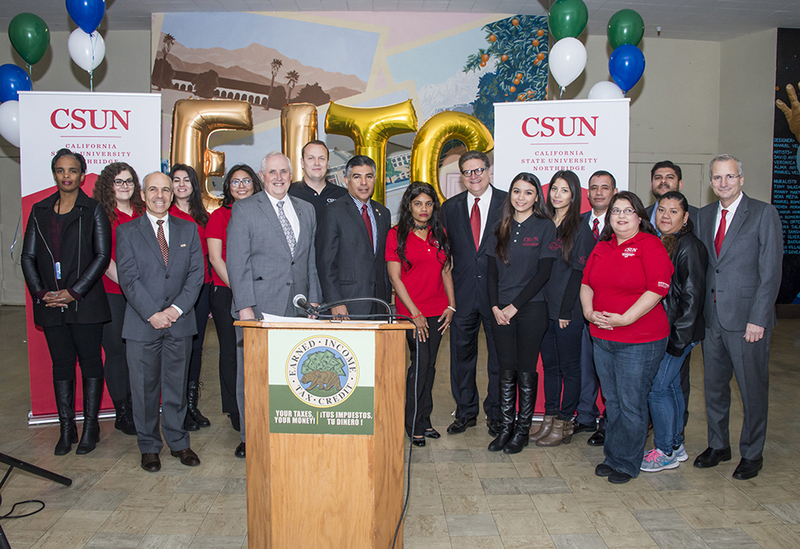 The partnership between Hertzberg, in collaboration with Citi Community Development, and CSUN’s Volunteer Income Tax Assistance (VITA) Clinic aims to improve the financial situation of thousands of struggling low-income families and stimulate economic development in San Fernando by encouraging residents to take advantage of free state and federal tax preparation services offered by accounting students from CSUN. The senator’s goal is to increase the number of eligible families receiving Earned Income Tax Credit (EITC) as part of his ongoing initiative to spark economic and community development throughout the City of San Fernando. With assistance from Hertzberg and Citi Community Development, which is helping to fund for the program expansion, the VITA Clinic has expanded its services this year by opening three new clinic locations in San Fernando: the San Fernando Library, Las Palmas Park and Morningside Elementary School. Maribel Gonzalez, a Morningside parent and taxpayer assisted by VITA, said through a Spanish-language translator that she was thankful for CSUN students and Morningside Elementary for providing the services and helping the community accomplish so much. The VITA Clinic is powered with more than 300 volunteers who are IRS-certified tax preparers and operates at 12 sites operating six days a week throughout the San Fernando Valley, offering 120 hours of service every week. Throughout the past year, VITA has increased the number of taxpayers served from 369 to more than 3,600. VITA has saved Los Angeles residents an estimated $1 million in tax preparation fees, brought $3.6 million in federal and state refunds back into the community boosting the local economy, and helped workers claim more than $1.1 million in EITC, helping people to move out of poverty. Rafi Efrat, CSUN’s Bookstein chair in taxation and VITA program director, said that this year VITA’s goal is to embark on a similar transformation in the City of San Fernando. CSUN’s VITA Clinic is now open to assist low-income taxpayers through April 15 at the various clinic sites around the San Fernando Valley and at the CSUN campus. The clinics accept walk-ins, but taxpayers are encouraged to make appointments through VITA’s website (vita.csun.edu) or by calling (818) 677-3600. For more information about VITA or Sen. Hertzberg’s other efforts to support San Fernando, contact the senator’s district office at (818) 901-5588.